This view of the cathedral, resembles something out of a Hammer Horror. Some of those monuments were still in place when I was a child, in the early 1960's. 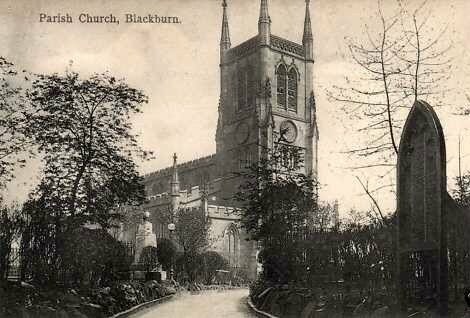 I don't know the date of the postcard, but as you can see from the text on it, they were still calling it the 'Parish Church', so it must pre-date 1926, as that is when the church achieved its cathedral status. Prior to being known as just 'the cathedral' it was known as The Parish Church of St Mary the Virgin and it is believed a place of worship has stood on this spot since the reign of Ethelred the Unready (978 - 1016). I don't like walking through the cathedral grounds after dark nowadays. I think I would have been even more reluctant, back when this photo was taken. It looks spooky !